I've been too long I'm glad to be back. It’s the day after Thanksgiving, the ‘beginning’ of the Christmas shopping season. 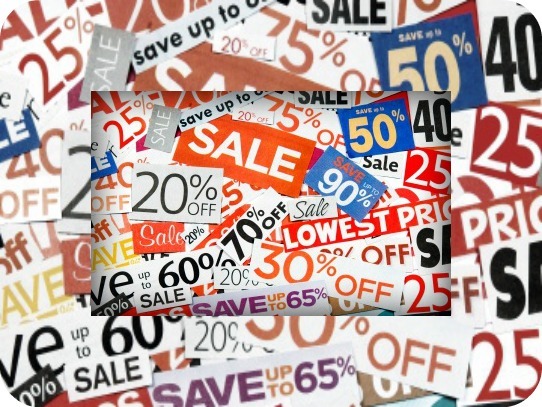 It’s called Black Friday and it’s a crazy day! It’s not really a holiday but most people who don’t work in the retail business have the day off. 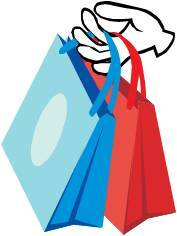 Everyone deserves the chance to participate in the shopping frenzy! The news is already full of stories of people who have their Thanksgivings dinners delivered or prepared in the parking lot of a business where they’ve taken temporary residence while waiting for the magic hour when the sales begin! There was a time when I was an avid Black Friday shopper. 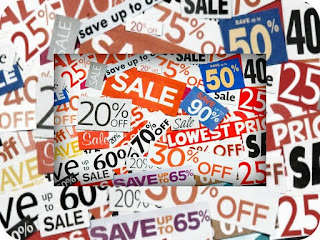 The husband and I would head out early in the morning to whatever store we had chosen, hoping to snag a bargain. We’d get lucky sometimes and actually get what we went after. But we weren’t aggressive shoppers and agreed that if we scored it was good but if we had to get physical to negotiate the deal it wasn’t worth it. We’d finish up and go to IHop or Golden Corral for a great breakfast then head home for a nap. Most often we’d finish and be back at the house by 9:00 am. I’m not sure whether it’s old age or just the trouble of getting out in the crowd, but there’s seldom a bargain strong enough to attract me now. I haven’t even looked at the ads to see what I’m missing! My daughter is planning to participate. My husband is even talking about it. Me? I’ll stay in with the littles. We’ll make pancakes and hang out in our pj’s til they all get back. We tried these. They didn't turn out as pretty as hers but they were tasty! I’m starting to listen to the tv and I’m hearing some tempting commercials. I do need a Christmas tree and I hear there’s one for half price. Then there’s that Crockpot, a fancy one, for just 16.98. And I could buy a sweater and get jeans free and……nah. That old Black Friday Magic almost worked. But not quite! 'Cause it's gettin' me high. Forget the hearse 'cause I never die. Thanksgiving dinner was nice. As expected, it wasn’t finished on time, but that was an oven error on my part. We had too many baked dishes this year, and even with two ovens there wasn’t enough room. We added some new cuisine this year, just for a change. Two dishes I had actually made before but it’s been so long nobody remembered. Callye added fresh Brussels sprouts sautéed with bacon. I don’t really care for Brussels sprouts, but bacon makes anything palatable! We cooked and cleaned all day and now there is some relaxing to be done! 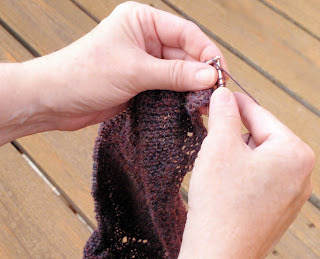 I’m working on a shawl for my sister to give to someone. 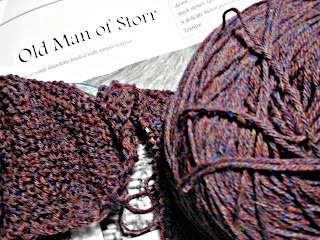 It’s alpaca, purple, red and blue yarn, depending on how you look at it! I’m on a deadline so I have to get it finished and in the mail. I’m ready to hunker down with a good movie or two and knit on! Surprise! There are some Black Friday specials…online! That kind of shopping I can do. Especially if there is yarn involved! I like shopping even more if I can knit at the same time! Check Our Creative Spaces for lots of cool projects! I skipped Black Friday this year too. There really isn't anything I want or need - - - and even if there was, I'm not about to sleep overnight in line to get it! 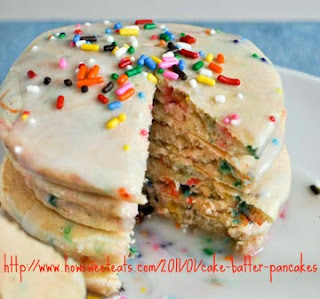 The cake batter pancakes look good - I've been wanting to try them! The sprinkles I had turned our pancakes pink. They tasted good but if I do it again I'll just use the cake mix that has the sprinkles in it already! They have Christmas colored ones out now too.